Westminster pupils’ names litter school buildings and Westminster Abbey, from the back of the Coronation Chair to the walls of rather different ‘thrones’. 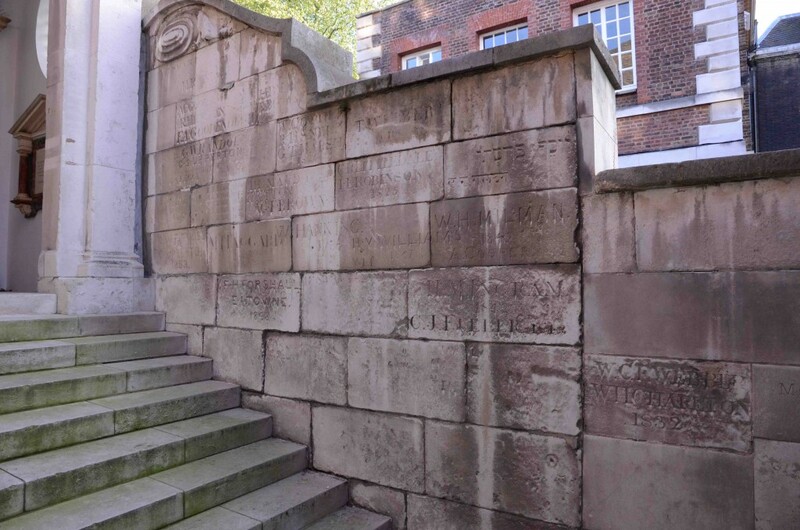 A tradition for quasi-official inscriptions developed in both College and School, both of which were covered with the names of former pupils, often grouped by family or election, prior to buildings destruction by bombing in the Second World War. A few of these inscriptions remain, particularly on the window ledges of some of the study bedrooms in College. Between the College and School itself, the School Gateway miraculously survived blitz unscathed. From the late 18th Century the tradition of carving ones name on the School Gateway became established, becoming widespread in the early 19th Century. 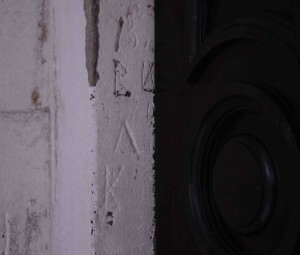 As a rule, the pupils employed stone-masons to carve their names for them, rather than complete the handiwork themselves. With Westminster Abbey next door there must have been a ready supply of craftsmen prepared to undertake this work. However, there are some more amateur inscriptions visible, particularly around the entrance to School. Dates are often included, and we can presume that in most cases these indicate when the carving was completed, but there is no consistency as to when in a pupil’s career at the school this would take place. It may well have been that pupils had their names inscribed to commemorate a significant event in their school life, be it election to College, University or participation in the Eton v. Westminster boat race. Some boys names feature twice, but the reason for this is not always clear. Naturally there have been some more recent attempts by pupils to add their names to the School Gateway, but now only the finest craftsmanship earns its place on the monument.